Everybody sees them. Big, dark birds soaring high in the sky with wings held in a V shape. People call them "buzzards." A friend sees hundreds of buzzards where he works. He's counted over 250 buzzards roosting near the top of his 20-story office building and an equal number roosting around the entire office building complex. He asks, "What do 400 or 500 BIG birds eat every day? That must be an awful lot of bird food. I think everyone in the office wonders about this." Another friend sees 40 to 50 buzzards on a bank building near his law office. He says, "The birds seem to derive most of their food source from the plentiful road kill up and down the busy thoroughfares. …they have become emboldened in their efforts to secure their meal even if it means starring down interested passersby." Though commonly called buzzards, the birds are actually vultures. The "buzzard" moniker originated with the early English settlers who thought the birds were like the soaring hawks they had called "buzzards" in the Old World. It was an understandable misunderstanding because the buzzards of the Old World (Eastern Hemisphere) included hawks, eagles, kites and even vultures. All those soaring birds were and are in the same bird family, Accipitridae. However, the vultures of the New World (Western Hemisphere) are in a separate bird family, Cathartidae, even though they superficially resemble the Old World vultures with their bare-skinned heads. There are seven species of New World vultures: the Andean Condor, king vulture, yellow-headed and greater yellow-headed vultures, California condor, turkey vulture, and black vulture. Only the black vulture, turkey vulture, and California condor---recently re-introduced into the wild---range in the United States. The birds my friends see on office buildings are the black and turkey vultures, each species differing slightly in physical appearance. Black vultures (Coragyps atratus) have gray, bare-skinned heads, short tails, and dingy white wing tips. Turkey vultures (Cathartes aura) have red, bare-skinned heads, long tails, and dingy white lining on the trailing edges of the spread wings. There are also behavioral differences. Black vultures have a less buoyant flight than turkey vultures, tending to soar in static circles on wings held at a slight dihedral angle (V-shaped pattern). Turkey vultures appear to bounce on the wind, up and down, and rock sideways on wings held at a pronounced dihedral angle. 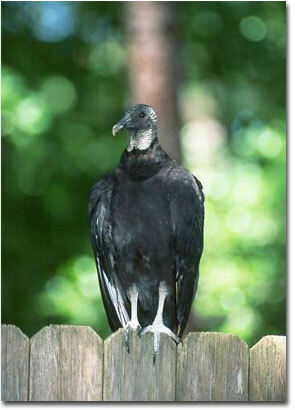 Black vultures often congregate by the hundreds on buildings, cliffs, trees, and other structures. Turkey vultures congregate in smaller numbers of maybe 25 to 50. Mr. Harper confirms that the nearly 500 vultures on his buildings are black vultures, and Mr. Crowder confirms that the 50 vultures on the bank building are turkey vultures. What do vultures eat? Dead animals, otherwise known as carrion. My friend was correct when he surmised that the turkey vultures were feeding on abundant road kill. Vultures are nature's garbage disposers. They not only eat carrion, but rotting vegetable matter. In some rural parts of South America, people in villages depend on vultures to clean up their garbage. In our urbanized village of Houston, we depend on vultures---whether we admit it or not---to clean the roadways of dead animals. Black vultures find carrion by sight, whereas turkey vultures not only find dead meat by sight, they literally sniff it out. Recent scientific research has shown that all birds have a sense of smell greater than was once deemed possible. But turkey vultures have a larger olfactory bulb than most other birds and thereby, have an incredibly keen sense of smell. In fact, engineers once put the chemical scent of decaying meat, ethyl mercaptan, in an underground gas pipeline. They discovered that they could detect pipeline leaks by watching turkey vultures fly over sections of the pipeline route, obviously sensing the odor of dead meat. Maybe birds that eat dead things seem repulsive. But my friends used words like "majestic" and "graceful" to describe the flight of vultures. I agree. They are serenely elegant when soaring in the skies. Vultures soar through the skies by gliding on air currents and thermal updrafts. Air currents in the city come from the updrafts of wind blowing against office buildings. That may be why black vultures hang out on the 20-story office building. Thermal updrafts arise from city streets, waterways, and open land. No doubt, turkey vultures ride the thermal updrafts from the tangle of thoroughfares and the wide expanse around the bank building. Soaring, or gliding, requires less consumption of energy than the flapping of wings, but it also requires careful maneuvering. Vultures manipulate the slotted tips of their primary feathers and tilt their high cambered wings (beveled like the leading edge of an airplane wing) to stay aloft on rising air. However, as any glider pilot will tell you, when you're gliding you're also sinking. Vultures offset their rate of sinking by skillfully piloting the rising air masses. They can fan or fold their flight feathers, alter their wingspread, and sweep their wings backward in order to sail over the ever changing thermal updrafts and air currents. Soaring high in the sky enables vultures to scan a large area for carrion. Both groups of vultures have a carrion cafeteria spread out under them every day. Hollywood movies often depict vultures soaring in the sky awaiting the demise of a hapless cowboy stranded in the desert. Wrong scene, Hollywood. Vultures have no premonition of impending death. They look for things already dead. Gary Clark is a writer and associate dean of natural sciences at North Harris College in Houston, Texas. Kathy Adams Clark is a professional nature photographer. Learn more about them at www.kathyadamsclark.com.